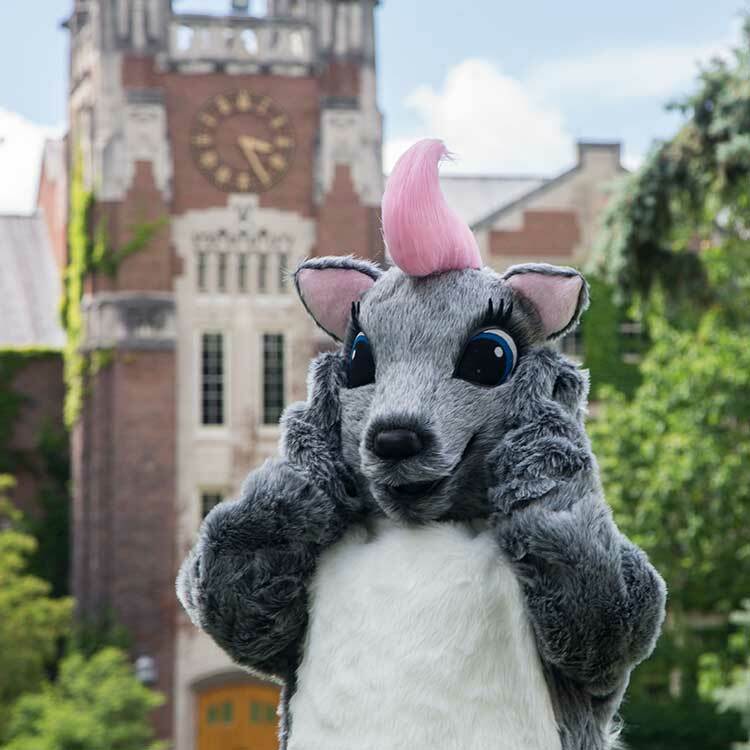 WGSU’s first official mascot, Genevieve Suzanne Upton — a lovable squirrel who goes by the nickname “Genny” — was born June 21, 2017 (the first day of summer) in Anne S. Blake Hall, on the upper part of the SUNY Geneseo campus. She is a blue-eyed, rosy-cheeked, pink pony tail-wearing Sciurus carolinensis (or Eastern gray squirrel). Genny (as she’s known to most people — though close friends call her “Genny Sue”) shares common initials with the WGSU call letters (aside from the regional-specific initial letter in the WGSU call sign, that is). Her full first and middle names share French and English origin. The surname Upton is an English habitational name: Up- “upper” + tun “settlement” — meaning one residing in the “higher part of the settlement” (in other words, the Sturges Quad/Blake Hall region, above the lower dormitory settlement area of campus). Genny’s first name was selected due to the affectionate nickname many people — especially students, past and present — have for Geneseo. Initially, consideration was given to naming her the more common but less obvious Jennifer (“Jenny,” for short), before Genevieve was chosen. The idea of acquiring an official station mascot was first conceived almost two years prior to Genny’s arrival. Suggestions for a small handful of animals (primarily) were bandied about by members of WGSU’s Executive Council. Motivated by the well-known abundance of friendly (or, at least, strangely uninhibited) squirrels on the Geneseo campus, it was agreed: WGSU’s mascot would be akin to the prolific little critters. Plus, having a squirrel as a mascot (and a female one, at that) would be most uncommon. Genny was custom-made by Animal Mascots (a division of International Fun Shop, based in Seabrook, Texas). After traveling from Seabrook via League City and Houston, Texas, through Hodgkins, Ill., and then onto stopovers in Buffalo and Henrietta, N.Y., Genny finally arrived on campus on June 14. But she didn’t emerge from her cocoon, in Blake Hall, until a week later. Her official birth announcement was made on Facebook over several days, culminating on July 4. Nowadays, Genny most often can be seen wearing a Geneseo Ice Knights jersey (uniform number 89.3), attending hockey games at The Ira, rockin’ out (and hanging with the food trucks) at Genny Fest Music Festival & Food-Truck Frenzy™ (named in her honor), and meeting fans at a variety of station events, on-campus and off-campus. By far, Genny is the friendliest, most loveable (and most beautiful) squirrel this side of the Genesee River! To inquire about Genny’s availability or for any other questions about her, contact Genny@geneseo.edu.